Born in 1966 in Legazpi, Spain, Juan Kruz studies music since the age of 6 and develops a career as a countertenor. He dances for the first time in Marcelo Evelin’s choreography Muzot (1990). He has worked since with Pieter C. Scholten, Emio Greco, Arthur Rosenfeld, Luc Dunberry, and with Lloyd Newson in the DV8 Physical Theatre production Enter Achilles, amongst others. As dancer, actor and choreographer Juan Kruz takes part in various awarded films ((LEFT) BETWEEN US, Georgia, Le Coeur volé, Konings Kinder, Allée der Kosmonauten, Enter Achilles). His collaboration with Sasha Waltz starts in 1996: Allee der Kosmonauten (1996), Zweiland (1997) and Na Zemlje (1998). From 1999 to 2005 he is a member of the Dance ensemble of the Schaubühne am Lehniner Platz where he could be seen in the choreographies Körper, 17-25/4, noBody, insideout and Impromptus by Sasha Waltz. 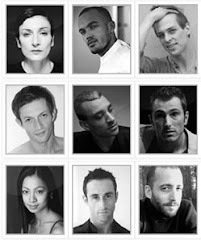 Since March 2005 he is a member of Sasha Waltz & Guests. Juan Kruz dances in Sasha Waltz’s choreographies Dido & Aeneas (2005), Gezeiten (2006), Medea (2007), as well as in Luc Dunberry’s Don’t we (2005), for which he signed the music as well. He was assistant to the choreography of Sasha Waltz in Roméo et Juliette for the Ballet de l’Opéra de Paris (2007). Juan Kruz dances, and is the project director and artistic assistant of Jagden und Formen (Zustand 2008), concept and choreography of Sasha Waltz. He is repetiteur and rehearsal director for Sasha Waltz. Together with Luc Dunberry, Juan Kruz creates Anything else (1998) and The rest of you (2000), and he invites Luc Dunberry, Damien Jalet and Sidi Larbi Cherkaoui to co-direct and co-choreograph his project D’avant (2002), piece for which he signs the musical concept and direction. In collaboration with the Australian music performer Joanna Dudley he creates the awarded music-theatre piece My dearest My fairest and He taught me to yodel. In 2004, he devises and creates COLOURS MAY FADE WITH FRICTION READ INSTRUCTIONS CAREFULLY STORE IN A COOL AND DRY PLACE NO SIDE EFFECTS, again with Joanna Dudley. He directs, choreographs and dances 4 Elemente - 4 Jahreszeiten (2007), a project with the baroque orchestra Akademie für Alte Musik Berlin. In Ars Melancholiae (2008), he brings him further in his quest of bringing voice and movement together.